Ahead of his two-day state visit to Iran, PM Narendra Modi had tweeted: "India and Iran enjoy civilisational ties and have shared interest in the peace, security, stability and prosperity of the region". PM Modi was accorded a ceremonial welcome upon his arrival in Iran on 22 May. Later that day, he addressed a gathering at Iran's Bhai Ganga Singh Sabha Gurudwara, which was founded in 1941. During his meeting with Iran President Hassan Rouhani, PM Modi discussed a number of bilateal issues - including in the areas of trade, economy and scientific and academic cooperation. 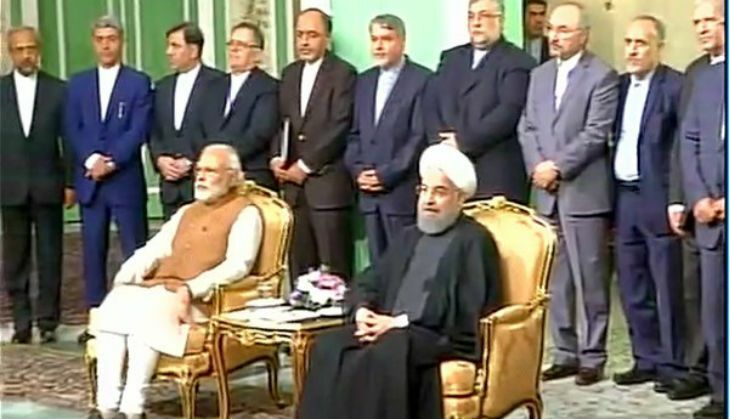 A landmark trilateral agreement between India, Iran and Afghanistan to develop the Chabahar port was inked on 23 May. Here's a look at the 12 agreements that were signed on 23 May. This MoU is intended for the purpose of credit of US$150 million for Chabahar port. This confirms the availability of credit up to Rs 3000 crore for the import of steel rails and implementation of Chabahar port. The agreement will see an extension of the CEP for the period 2016-2019 covering the areas of culture and art; radio, TV, mass media and cinema; and relevant general and financial terms. This agreement seeks to create a Joint Secretary/Director General policy dialogue as well as encouraging new institutional mechanisms between think tanks on both sides. There is also a provision for a conference on contemporary issues of regional and global significance. The objective is for the two parties to jointly explore the possibility of manufacturing aluminium metal by setting up of a smelter on joint venture basis in Iran and/or entering into tolling arrangements with smelters in Iran or any other form of business collaboration. This MoU will enable IRCON to provide requisite services for the construction of Chabahar-Zahedan railway line which forms part of transit and transportation corridor in trilateral agreement between India, Iran and Afghanistan. Services to be provided by IRCON include all superstructure work and financing the project (around US$ 1.6 billion). The agreement is aimed at facilitating exchange of information and knowledge in the field of archival matters through exchange of manuals, guidelines, rules, publications and other special literature on archival topics. READ NEXT >> New CSE study says the bread on your table could kill you!